Honor a mother's love. 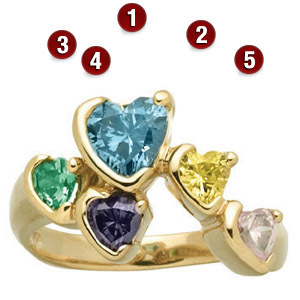 This ring features a 6x6mm and 4x4mm heart shaped gemstones. Choose two to seven gemstones. Each is prong-set. Ring is available in white or yellow, 10k or 14k gold, with simulated or genuine birthstones. This ring is not available with one gemstone.